When I was a kid, living in Germany with my USAF family, one of my favorite dishes was ochsenschwanzsuppe — oxtail soup, a thick and flavorful beefy broth. In later years, married and living in the USA, I’d sometimes pick up a package of Knorr Oxtail Soup Mix, surprisingly good for an instant soup mix, with a rich flavor and smell close to what I remembered of the real thing. 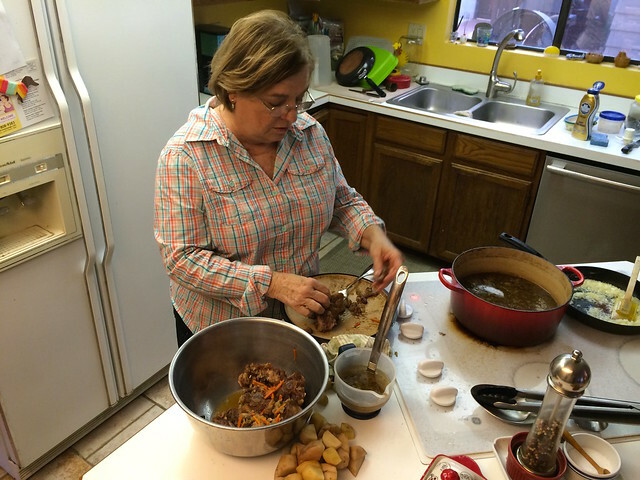 Yesterday Ditalini cooked up a pot of real oxtail soup, adapting a recipe from a German cookbook. She added some root vegetables to make it her own, actually more of a stew, but the broth itself was the oxtail soup I remember, sinfully rich and tasty. 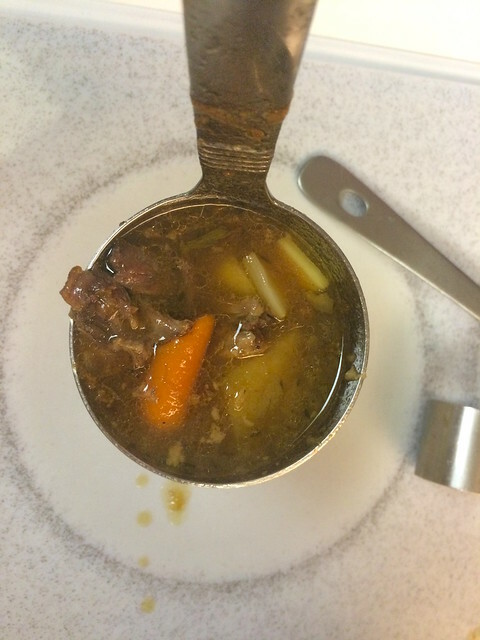 To make a brothier oxtail soup, just leave the stewing vegetables out of the ingredients. The oxtails you’ll find at the grocery store or butcher shop probably don’t come from actual oxen, but from regular beef cattle. I’m sure they taste the same. Preparation time: about three hours, but a lot of that is sitting around while the soup simmers. Brown the oxtails in a little olive oil and remove from pot. Now sauté the finely-chopped pot vegetables. 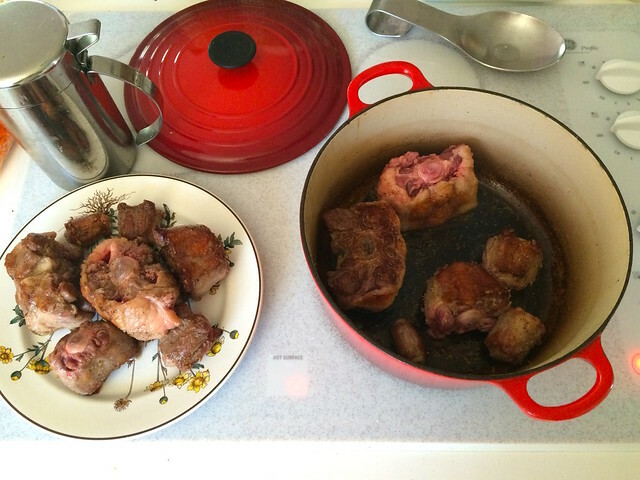 Return the oxtails to the pot and add the water, beef stock, bay leaf, thyme, and peppercorns. Bring to a boil, then cover and simmer for 2 hours. Cut up the stewing vegetables and set aside. Make a roux in a separate frying pan with butter, onion, flour, and a cup of broth from the pot. When the oxtail soup has simmered in the pot long enough, add the roux and stewing vegetables, the paprika, madeira or sherry, and salt to taste. Cook uncovered until the stew vegetables are done. 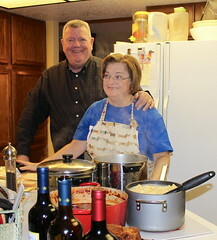 Ditalini took an additional step: before adding the roux and stewing vegetables to the pot, she fished the oxtails out of the broth with a slotted spoon, let them cool, then picked the meat off the bones and returned the meat to the pot. © 2015, Crouton deMenthe. All rights reserved.